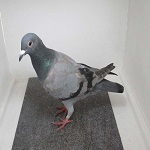 Racing Pigeons,Show & Fancy Pigeons :: Message Forum :: 2011 YB Auction. Just thinking about it, you could bring a couple for you and Rene from the island when you collect these auction birds if you were interested, as i appreciate the only thing holding this idea back is the courier costs. I think last time anything was posted we had 4 or 5 members wanting to take part, i know Ken & Mum/Dad and interested and if you/rene up for it we would nearly be halfway there. just had a look at the birds on offer, upset i missed the sale. all the best to those who bought birds though, hope they do well for you all. yes it;s good to try out good bird;s just to see how thy compare with yours. just some thing to look forward to next year if all;s well. certainly is mate, are they doing the yb exchange again this year. the main reason being how ever go our bird;s would have to pay about 45 pounds for carriage. 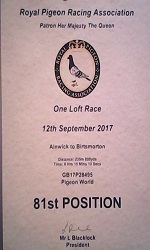 this year we got RAY;S birds and both birds were 19th open results. we have lost one of them. but still got one here. so i hope you do well if you go into it. 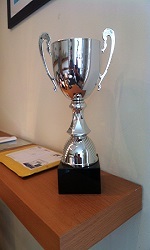 im looking forward to the yb exchange again this year john, and also the nfc oneloft which mark is running now.............we might get some winners from our team which members are entering. have you received all payments for the auction birds now mark........? so mark, with it being christmas and the post will be effected etc......would it be best to send the cheque for the oneloft after christmas or the new year...? your right, the cheque i sent you for the auction birds took a week didnt it.......would have normally been the next day.